On our way back from visiting my elderly mother in Napanee earlier this week we stopped at a spot where the Salmon River tumbles over a small dam on its way toward Lake Ontario. As we opened the doors of our vehicle we were immediately aware of the sound of the rushing water, and it was music to our ears. When we eventually drove away it was as though we were leaving a stirring concert. 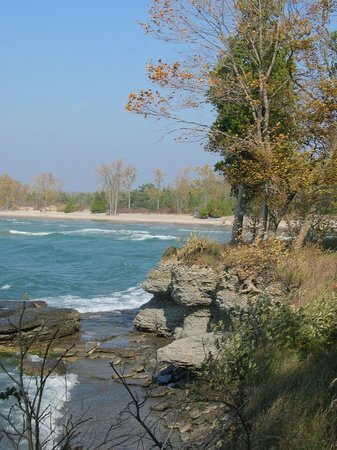 Often I drive to Lakeshore Lodge Point in Prince Edward County where the land juts out into Lake Ontario. I love a windy day when the sound of waves comes from both sides of the point with a different tuning from east and west. I didn't plan to write a second blog on water in the same week but this is World Water Day and I noticed an event which will take place in Australia today to mark the occasion. Celebrate World Water Day with immersive compositions exploring the soundscapes of aquatic ecosystems ranging from the sonic complexity of the Great Barrier Reef to melting glaciers in Antarctica. The concert features internationally renowned and emerging composers who have pioneered the use of hydrophones (underwater microphones) in aquatic ecology and music composition. The event will open with leading freshwater ecologist Dr Simon Linke introducing the latest research in freshwater ecoacoustics using sound to monitor the health of aquatic environments. This event is part of Griffith University’s program for World Science Festival Brisbane 2018 – an international event that explores and celebrates the entanglement of science and art. This sounds innovative and fascinating, but it would be a bit of a commute in order to attend. We receive so much grim news about the degradation of water and both the increased scarcity and overabundance through drought and flooding, respectively, due to climate change. While we are blessed with an excellent water supply in most of this province there are dozens of First Nations communities under boil-water advisories. In the midst of these sobering realities it's important to give thanks for the taste of water which quenches our thirst, but also for the sight and sound of water, which are gifts from the Creator. There is a mystical quality to the sound of running water which is constantly changing due to season and circumstance. There is a hopefulness to a stream or river which finds its voice again after a period of frozen silence. We may not find our way to running water today but the next time you do, receive the sounds as a song and a prayer. Express your gratitude to the God who formed the waters of Creation and whose Spirit brooded over them. Listen for the voice of Christ who is Living Water.